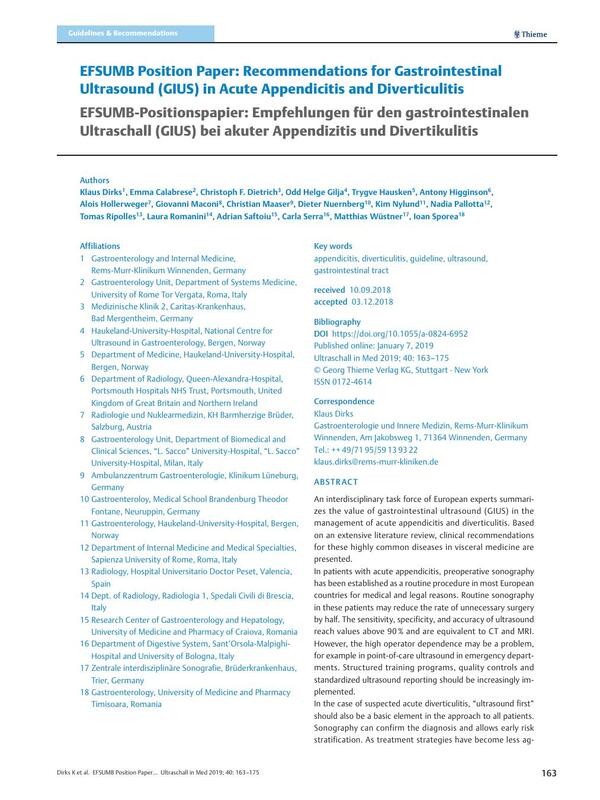 An interdisciplinary task force of European experts summarizes the value of gastrointestinal ultrasound (GIUS) in the management of acute appendicitis and diverticulitis. Based on an extensive literature review, clinical recommendations for these highly common diseases in visceral medicine are presented. In patients with acute appendicitis, preoperative sonography has been established as a routine procedure in most European countries for medical and legal reasons. Routine sonography in these patients may reduce the rate of unnecessary surgery by half. The sensitivity, specificity, and accuracy of ultrasound reach values above 90 % and are equivalent to CT and MRI. However, the high operator dependence may be a problem, for example in point-of-care ultrasound in emergency departments. Structured training programs, quality controls and standardized ultrasound reporting should be increasingly implemented. In the case of suspected acute diverticulitis, “ultrasound first” should also be a basic element in the approach to all patients. Sonography can confirm the diagnosis and allows early risk stratification. As treatment strategies have become less aggressive and more tailored to the stage of diverticulitis, accurate staging has become increasingly important. GIUS and CT have proven to have similar sensitivity and specificity. Especially in cases of uncomplicated diverticulitis, GIUS will be the one and only imaging procedure. CT may work as a backup and has particular advantages for diverticulitis located in the distal sigmoid, inflammation deep in the small pelvis and insufficient ultrasound scanning conditions. This step-up approach (ultrasound first and CT only in case of a negative or inconclusive ultrasound result) has proven to yield the best accuracy. Im Rahmen des EFSUMB-Leitlinienprojekts zum gastrointestinalen Ultraschall (GIUS) gibt eine interdisziplinäre Arbeitsgruppe von europäischen Experten einen Überblick zum Nutzen der Sonografie bei akuter Appendizitis und Divertikulitis. Basierend auf einer umfangreichen Literaturrecherche werden klinische Empfehlungen zu diesen häufigen Erkrankungen der Viszeral-Medizin vorgestellt. Bei Patienten mit akuter Appendizitis haben medizinische und juristische Erwägungen die präoperative Sonografie heute als Routineverfahren in den meisten europäischen Ländern fest etabliert. Die Sonografie kann hier die Rate unnötiger Operation halbieren. Sensitivität, Spezifität und Genauigkeit des Ultraschalls erreichen Werte von über 90 % und entsprechen CT oder MRT. Eine hohe Untersucherabhängigkeit kann jedoch problematisch sein, beispielsweise beim bettseitigen Ultraschall in der Notaufnahme oder Praxis. Strukturierte Trainingsprogramme, Qualitätskontrollen und ein standardisierter Befundbericht sollten deshalb Einzug in den klinischen Alltag finden. Auch beim Verdacht auf eine akute Divertikulitis sollte die „ultrasound first“-Strategie Anwendung finden. Die Sonografie kann die Diagnose einer Divertikulitis bestätigen und den Schweregrad abschätzen. Da heutige Therapiestrategien weniger aggressiv und mehr auf das Stadium der Divertikulitis zugeschnitten sind, ist eine genaue Einteilung des Schweregrads immer wichtiger geworden. GIUS und CT haben hier eine ähnliche Sensitivität und Spezifität. Gerade bei unkomplizierter Divertikulitis ist die Sonografie völlig ausreichend. Das CT kann als Backup dienen und hat Vorteile bei der Divertikulitis im distalen Sigma, bei einer Entzündung tief im kleinen Becken oder bei unzureichenden Untersuchungsbedingungen. Eine solche Stufendiagnostik (Ultraschall zuerst und CT nur im Falle eines negativen oder nicht eindeutigen Befundes) hat bei der Divertikulitis die höchste Genauigkeit bewiesen. 32 Chicaiza HP, Malia L, Mulvey CH. et al. Revisiting the Appendiceal Diameter via Ultrasound for the Diagnosis of Acute Appendicitis. Pediatric emergency care 2017; DOI: 10.1097/pec.0000000000001278. 44 Avanesov M, Wiese NJ, Karul M. et al. Diagnostic prediction of complicated appendicitis by combined clinical and radiological appendicitis severity index (APSI). Eur Radiol 2018; DOI: 10.1007/s00330-018-5339-9. 59 Kwon LM, Lee K, Min SK. et al. Ultrasound features of secondary appendicitis in pediatric patients. Ultrasonography (Seoul, Korea) 2017; DOI: 10.14366/usg.17029. 76 Dibble EH, Swenson DW, Cartagena C. et al. Effectiveness of a Staged US and Unenhanced MR Imaging Algorithm in the Diagnosis of Pediatric Appendicitis. Radiology 2017; DOI: 10.1148/radiol.2017162755. 112 Kim J, Kim K, Kim J. et al. The learning curve in diagnosing acute appendicitis with emergency sonography among novice emergency medicine residents. J Clin Ultrasound 2018; DOI: 10.1002/jcu.22577.